Dublin Bus wants to adjust routes and timetables for their bus services in Dun Laoghaire, Sallynoggin and Loughlinstown. The changes would affect routes: 7, 7b, 7d, 45a, 63 and 59. Routes 8 and 111 would be cancelled. McIntosh Park and Killiney village will lose the 59 service to Dalkey / Dun Laoghaire. Loughlinstown Park loses the 111 service to Dun Laoghaire and loses a third of its services on route 7. Residents of Maretimo in Blackrock village will have to walk to the bypass to catch a bus into town. Cherrywood’s service increases from 1 bus to 2 buses per hour. Shorter routes should mean faster journey times. Why is Dublin Bus changing these routes? Dublin Bus has lost nearly a third of its government funding in the past seven years. Fares have risen to make up the shortfall. The company is under pressure to cut unpopular services and reallocate buses to more popular routes. These changes are a continuation of the “Network Direct” exercise in 2012 when bus routes were straightened out or curtailed. This is only half the story. Dublin Bus also receives replacement buses from the state and a grant to cover the free travel scheme. 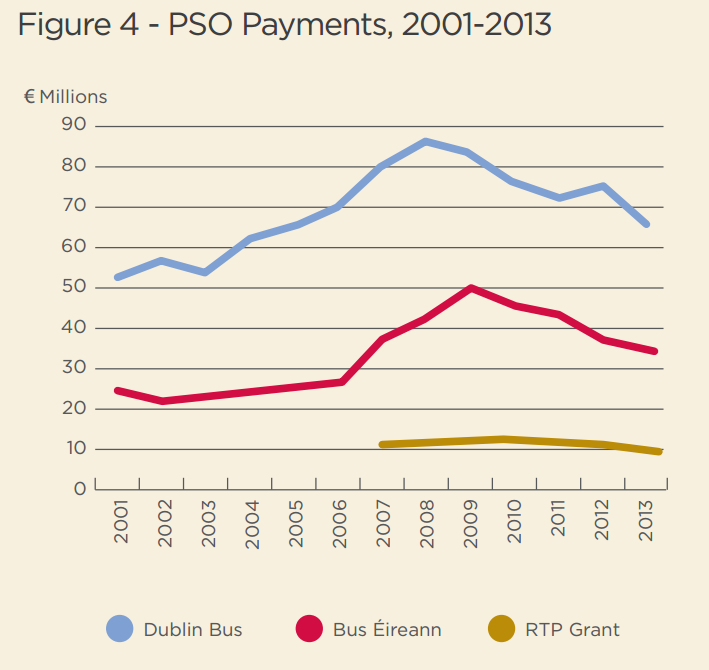 In 2013, these additional payments were worth €49m to Dublin Bus. Dublin Bus is not in dire straits. Their passenger numbers are increasing, they have little debt and they even made a €10m profit last year. So these are not cuts of necessity. Straightening routes is a good thing because it speeds up journey times but there are other ways to improve the service and attract more passengers. Areas with older residents that depend on local bus routes should not be left without a service. When the DART service began in 1984, CIE promised feeder routes that would take people from the inland suburbs to the coast to board the shiny train. For the past 30 years those services have been abysmal and often pointless due to low frequencies and unreliability to the point of randomness. Real time passenger information has definitely helped to deal with the stress of waiting forlornly at a stop wondering if the bus will ever come. However the NTA should now be enforcing predictable services that meet the timetable – particularly outside of rush hours when the traffic jam excuse does not apply. A major deterrent to using the bus service is the risk of being let down and Dublin Bus needs to win back trust to win back passengers. Dwell times are too long because the drivers are still required to collect fares and scan leap cards. More delays happen because the drivers do not consistently open the centre doors. The stage fare system is too complicated for anyone to follow. It needs to be replaced with a simple zonal system that passengers and staff can understand. Fattening the pig for privatisation? It may be that these routes are being changed to allow them to be bundled up and offered to a private operator. The decision about route changes is made by Dublin Bus and the National Transport Authority. Both of these organisations answer to the minister for Transport, Paschal Donohue. A public consultation is likely to be held before a decision is made. Local councillors are briefed by Dublin Bus and may make submission to Dublin Bus and the NTA but they ultimately have no decision making power in the process. A special meeting of Dún Laoghaire’s council area committee has been called for Thursday 23rd July to discuss these plans. Dublin Bus has been asked to attend. Dublin Bus will hold an open information day in Dun Laoghaire Shopping Centre on Friday 31 July 2015 between 1200 and 1600 hours. Well, I must say it is good new for residents in Cherrywood. One bus per hour was not enough and sometimes that one would not turn up or turn up late. I have often decided to walk onto the next stop if the bus due in Cherrywood was more than 15 minutes late and it has often arrived then and passed me while walking to the next stop. So at long last, thank you Dublin Bus. I have mixed feelings over these changes, partially positive. For a start, the new route for the 59 is generally welcomed as it is being given a much needed straightening out. The biggest plus to it is that it will bring people well within the vicinity of the Luas Green Line given that it will just be a short stroll away. It will also connect Dalkey with Ballybrack and Wyattville Road which was previously not the case and also a frequent and direct connection to the N11 on the Shankill side. The negativity comes from hearing that the 8 is to be discontinued and calling the 7d an alternative. Instead, the 7d and 8 should be amalgamated to form a proper bus route going to Stillorgan and then on to UCD and the rest of the way into town. Maintaining the current course of the 8 into town doesn’t make that much sense as it is essentially a duplicate of the DART passed Monkstown. Conversely, sending it up to Stillorgan and then covering the rest of the N11 from that point onwards would make far more sense. The biggest reason is that it’s new purpose would resuscitate it’s marketability. Moreover, the frequency of a route is one of it’s main selling points. Even a clock-face hourly schedule during the week and a 90 minutely service at the weekend would be a good start to work from. A peak hour only service is a means to an end given the lack of flexibility it gives would-be passengers. Most services operate between roughly 7AM and 11PM. The re-routing of the 7 is probably the biggest welcome of them all given that two of the most time consuming portions of it’s route are being skipped (Sallynoggin and especially Newtown Avenue). Combined, the omission of these two stretches should shave about 20 minutes off the journey length. As a result, this should encourage less people to drive. Speed is one of the most important factors in making public transport more attractive. Meg: Cherrywood clearly needs a better bus service for workers and residents. I worked in Sandyford Industrial Estate before the Luas and the bus service was unusable. At the end of each day you might get left standing for an hour or more. There was huge demand but Dublin Bus could not deliver a dependable service. Patrick: Public transport connections between some obvious destinations in the county are very weak. How do you get from UCD to Blackrock? or from UCD to Sandyford? or from Sandyford to Blackrock? The 47 and 114 are too sparse for the populations they serve. For many years, private employers have provided bus services for their employees in Sandyford to try to fill the gap. Very inconvenient change for the residents of Sallynoggin, a significant proportion are elderly and rely on the bus service and it is quite a walk to the Sally glen Rd. Also, if using later at night you would need to walk the long way around as either cutting through the back of the church or walking through the field at Rochestown avenue wouldn’t be feasible. I completely agree with your comments about Blackrock, Sandyford and UCD. However, answering your questions, to get to UCD from Blackrock is a short bus ride on the 17 while Sandyford is served by the 114 and Sandyford to UCD is covered by the 47. I do think the frequency of the 17 is acceptable during the week if a little bit scarce in the evenings but and very irregular on Sundays operating pretty much 2 hourly. The 114 could do with a little increase in its frequency during the day with a service or two later into the night perhaps, at 22:00 and 23:00. There a lot of gaps in the 47 timetable, particularly at peak times that need filling in. In short, Blackrock should match the same levels of service as Dun Laoghaire. Nevertheless, it still has the 4 and 7 buses which are fantastic. Back to the matter at hand though. I do think Dalkey also needs a frequent enough service into town albeit, not one which more or less mirrors the DART. What I’m talking about is a proper 7 day a week, hourly service operating along the Stillorgan Road covering UCD, Donnybrook and St. Stephen’s Green. Now is the perfect time to merge the 7d and 8 for such a purpose with a possible extension on the Dalkey end up to Killiney Village to pick up the slack of the re-routed 59. It could start off in Killiney Village and then work its way down Killiney Road. At the entrance to Killiney Hill, it would take a left turn down Saval Park Road. It would then turn right onto Barnhill Avenue covering the entire stretch. Then, another right would be taken onto Barnhill Road. From Dalkey, it could cover Ulverton/Hyde Road->Castlepark Road->Barnhill Road->Upper Glenageary Road->Kill Avenue->Abbey Road->Monkstown Ringroad->Stillorgan Village and then on into town. 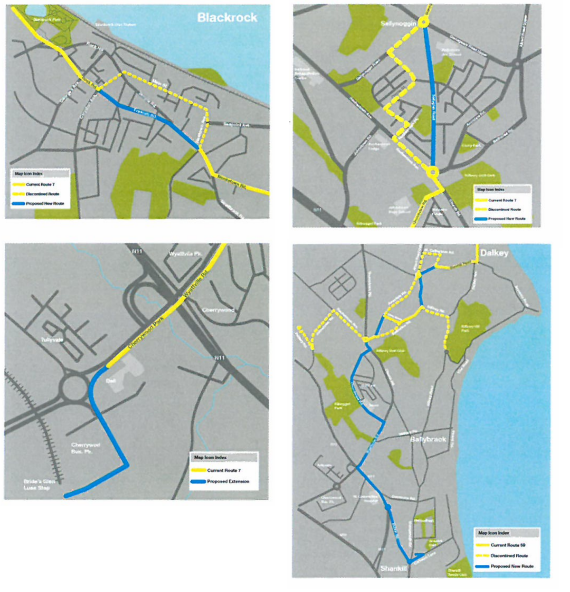 7 Route: It seems a good idea to avoid going into Blackrock village (or part of it) on the journey into Dublin. … not all change is bad ! I am stuck at both ends of the argument as I am working in Cherrywood I would be over the moon to see more buses going up that far. Given this re majority of the time when the 7 does show up at the cherrywood stop (usually 10 minutes late!) the bus becomes out of service forcing its passengers to take a 10/15 minute walk to the stop at ashlawn park from then we have to wait for the bus to come from loughlinstown however living in sallynoggin the loss of the 7 will be a major blow, I am aware that the 7 will pass through sally glen road however this will add an extra 15 minutes to my journey twice daily. I also feel greatly for the elderly in the sallynoggin areas as not so long ago the local post office was taken out of main shops and moved to centra on the top of the noggin hill meaning some older residents relied on the 7 to bring them there and back. If traveling from sallynoggin to dun laoghaire via the no.7 residents will be as quick to walk as to walk to the top of the hill is half the journey what is the point of getting the bus for the sack of 1 stop! However I am well aware that with sallynoggin having a large number of elderly residents this may not be feasible. I think it is a bad idea to change new routes and I always get the 45a bus to bring me into bray and i don’t want that bus to get off rochestown road. KILLINEY VILLAGE MAROONED- Village 1km from bus route. Is this Bus Consultation actually open? I cannot find the Consultation Document on either the Dublin Bus or NTA websites. Thanks for making it available on your site. The consultation document was provided to councillors by Dublin Bus. The consultation does not appear to be open to the public yet and may yet be amended before then. There is no harm in emailing them in any case. I think the loss to Killiney Village of the service to Dun Laoghaire is more significant than the loss of the service to Dalkey, as a result of the proposed changes to the 59 bus route. The ‘popularity’ or ‘unpopularity’ of a route has nothing to do with its importance or the social benefit it provides. As for ‘straightening the route’, the straighter the route the fewer people it serves. To cut off Killiney Village for the sake of a detour of hardly more than a mile is insulting and offensive. I am likely to be affected by the disappearance of the 8 route. The DART is a good 10 minutes walk away – no problem if you’re young but we are not. Merging the 7d and 8 and making a much more frequent service is a good idea and I am sure if it were regular enough it would be better used. If you remove the 59 bus from Johnstown road we the residents of Johnstown road and all of Johnstown estate as well as Granitefield Oakdale and Johnstown Court have no bus service. The 63 bus only services the lower end of Johnstown road where there are very few residents. you have already removed the 7a please do not remove the 59 personally I cannot walk to the graduate or the N11 to get public transport. Why has the 59 to go up Churchview road there are two other buses on that route. When the 59 is coming from Cherrywood why not travel up the N11 and up Johnstown road and on to Dalkey. Please do not leave this large residential area without a bus service. Thank you I hope you will consider this suggested route for the 59 bus. Thanks Ellen, Jacinta, Roger and Pat for your comments. I will include the points you make when I make my submission to Dublin Bus and the NTA. Removing the 7 bus from Sallynoggin is absolute madness. the clue is in the word “service”. If the bus stop is too far from you that is not a useful service. The 7 route can be a torturous one if you are trying to get into town so cutting out parts would make it quicker-but so would removing most of the stops. Let’s do that! Just have first stop and last stop, save petrol and time. The passengers? Ah well sure they can use cars, just what we need more of. There is local demand for people to travel to Dun Laoghaire for shopping, hospital etc. How about a local bus following a circular route from say, Cherrywood (like the present 7 route), to Dun Laoghaire, running regularly and frequently? Thanks Catherine – good suggestion about having a local circular route. I agree with Ellen’0s comments about losing the 59 bus . The 59 serviced the upper part of Johnstown Rd bringing passengers to the dart. With the proposed changes,this area which has mixed age group of workers, pensioners etc .will suffer with no access to the dart to get into Dublin city centre. Can you find out if there will be a bus at Bridesglen terminus which could service the Johnstown area of Cabinteely. This seems to be a forgotten area. Can you please review this again.Many thanks,apologies if this area has been taken care of. I only found out today about these changes. My kids get the bus from Dalkey to Killiney village after school. This will be a disaster for us changing the route. It’s only a 20 minute walk for adults but it’s a long walk for young kids. I only today discovered that the proposed (decided?) route changes in the Sallynoggin area were published on the Dublin Bus website on 27 July and “feedback” was sought by 14 August. Just four days notice was given of the 4-hour “Information Day” in Dún Laoghaire Shopping Centre (with no details of exactly where in that premises) on Friday 31 July. Despite the alleged role of the NTA in specifying levels of bus service, there was no mention of any feedback option to that body. It is difficult to see the purported consultation as anything other than a joke, or in Dev’s words, an empty formula. Website publication is not a substitute for old-style printed notices in the areas affected, the notice period for the “Information Day” was ludicrously short, and the 3-week response period was unreasonable, given the lack of awareness on the part of many users of the services of the proposed “improvements” (by withdrawal of service). It seems clear that it’s a done deal, but you may be able to make some representations on behalf of local bus users. In my case, I had surgery on 31 July and by dint of convalescence, I was not in a position to look at the matter again until very recently. I will endeavour to put in some feedback by Friday this week. I agree that the communication is not enough – too few people people knew about the changes. Dublin Bus has plenty of advertising space on buses and bus stops that they could use. They should also leaflet the relevant areas. I made a written submission which included the points I made above, while taking on board the comments made by people here and sent to me by email. If you forward me any comments you have, I will send them directly to the appropriate people in Dublin Bus. I have written to the NTA to ask them why the consultation was not on their web site and if they have standards for how consultations are held and promoted. I will let you know what they say. The plan is that the 63 would continue the same route through the farm.